Sam, left and Stuart Coltherd with Captain Redbeard. The world’s greatest steeplechase is almost here again – and some top Borders talent will be taking part. On Saturday at Aintree, it’ll be time for the Randox Health Grand National, one of the greatest sporting occasions in the world – with two horses either owned or trained locally taking part. Belinda McClung, left, and Deborah Thomson, co-owners of One For Arthur (library image by Grossick Racing Photography). 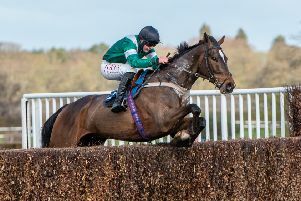 One For Arthur, who scored a thrilling memorable victory in 2017, is back after a lengthy lay-off because of injury, with winning jockey Derek Fox in the saddle once again. One For Arthur is owned by the Borders consortium of Deborah Thomson and Belinda McClung – better known as the Two Golf Widows. Also returning to the course is Captain Redbeard, who took part last year, trained by Selkirk’s Stuart Coltherd and piloted by Stuart’s son Sam. Both camps said they were are deeply privileged to be involved again and, above all, hoped for a safe, enjoyable race. One For Arthur returned gingerly to race action over the festive season but both Deborah, from Cessford, and Belinda, of Ancrum, said he deserved his chance at Aintree again. “We’re very pleased to have him back again,” said Belinda. “He is in good order. “We’ve not had the best of preparations for the race, because he was off for a year and then he had a few niggles and issues. “But (trainer) Lucinda (Russell) and the team have done a great job. “He seems to be back where he was a couple of years ago but you never know – you need a lot of luck in the race and we are just hoping for a clear round and for him to get round safely,” added Belinda. Co-owner Deborah was equally convinced that their 10-year-old former winner was there on merit. The memories of 2017 were still very pleasant, said Deborah adding she and Belinda were delighted to be there. “He owes us absolutely nothing,” she said. “All we want is to get him safely back in that lorry, going home at night. If he gets a clear run and gets a bit of luck, it would be lovely if he ran himself into a place. Over at Selkirk, Stuart Coltherd admitted he too was excited about the race – after some contradictory information about whether Captain Redbeard would take part – and agreed that luck was certainly needed on the day. Captain Redbeard, with Sam Coltherd on board, took part last year – but the Captain unseated Sam at the seventh fence, the Foinavon. “We learned a lot from last year but, in a race like that, you’ve got to have a certain amount of luck regarding where to be, or where to try and be,” said Stuart. He added the National was the “number one race” and it was reportedly watched by around 66 million people around the world last year. It was “mind-blowing” being involved in something like that, he added. Sam was “a year older and a year wiser” said his dad, and had gathered more experience since then. “Being a jockey is one of those things you can’t replicate it anywhere else apart from riding horses and riding winners,” said Stuart, adding Captain Redbeard’s form going into the race had been “every bit as good as last year”. “I feel, all being well, I would like to think he’ll run a big race,” he added. Captain Redbeard, who won the Malcolm Jefferson Memorial Chase in February, could also be due to race at Kelso on Monday. Kelso race preview –page 71.